Giving you the tools to make your journaling Bible truly your own, this helpful book is filled with tips to grow creativity. Don't know where to start with Bible journaling? Discover a powerful new way to engage with Scripture through art in this inspirational guide to Bible Journaling. Talented artist Joanne Fink explains all the basics of this beautiful art form that connects faith with creativity. Joanne teaches lovely techniques for expressing your faith like lettering, illustration, and embellishment using markers, gel pens, pencils, stamps, stickers, overlays, and paint. Learn about the wonderfully fulfilling benefits of Bible Journaling, and get helpful advice on choosing scripture and the types of Bibles and journals to use. Some of the world's leading Bible Journaling artists provide colorful examples and inspiration, including Shanna Noel, Rebekah R Jones, Valerie Wieners-Massie, Tai Bender, and many more. 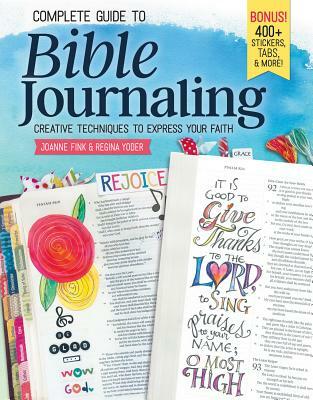 Complete Guide to Bible Journaling by Joanne Fink; Regina Yoder was published by Quarto in March 2017 and is our 1738th best seller. The ISBN for Complete Guide to Bible Journaling is 9781497202726. Be the first to review Complete Guide to Bible Journaling! Got a question? No problem! Just click here to ask us about Complete Guide to Bible Journaling.